*If you prefer to experience our hike through photographs instead of words feel free to scroll to the bottom and check out all the incredible images Kyle captured during this hike. He is pretty amazing with a camera and they turned out awesome. While the words can hardly do the beauty justice hopefully you will enjoy them as well. If you haven’t noticed by now I am not the most spontaneous of adventurers. I like to plan things. No, I LOVE to plan things. When we adventure the planning part of the process is a major part of the fun. I don’t think Kyle and I had ever run off on an adventure I didn’t spend at least a couple of days thinking about until this last weekend when we carried out our most last-minute plan to date. Last weekend Kyle and I were robbed of our weekend plans to attend a rodeo in Sisters, OR. We found this out on Thursday night, making our eminent Friday morning departure obsolete. However, not two to let a weekend go to waste we decided to instead climb Colchuck, a mountain guarding the entrance to the Enchantments. Our plan was for Kyle to come home from work as early as he could, we would pack, swing by the grocery store and grab some grub, and then head to Leavenworth where we would sleep in our car at the trailhead and hit the mountain on Saturday morning, early. Kyle got home from work on Friday around two o’clock and we started to gather our stuff. Remembering last-minute obstacles I went online to check and see what kind of permit or hang tag we needed in our car. That was when I discovered that last weekend, June 13th and 14th, was the final weekend to camp in the Enchantments without a permit. Asgard Pass in the middle and Dragontail peak on the right. 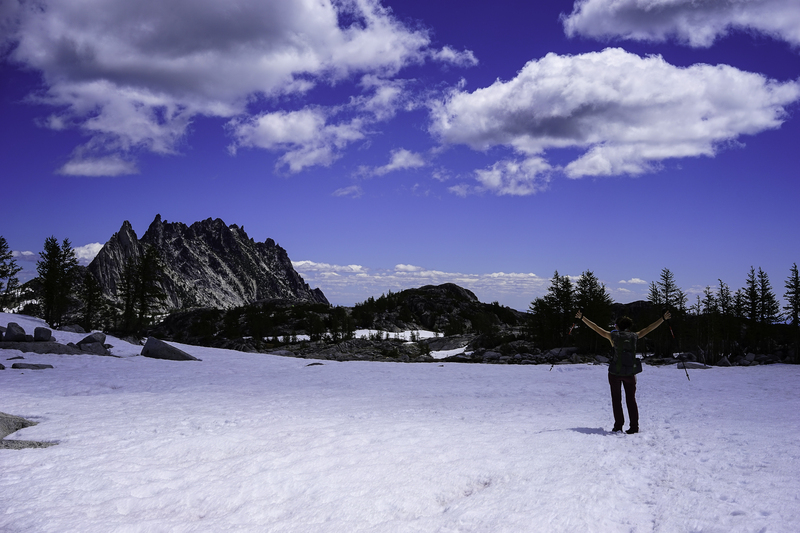 If you aren’t from Washington or have never heard of the Enchantments let me fill you in. The Enchantments is considered to be one of the most beautiful places in Washington by many an experienced outdoorsperson. It is located outside of Leavenworth on the Eastern side of Washington making it a drier clime than the Puget Sound area we call home. 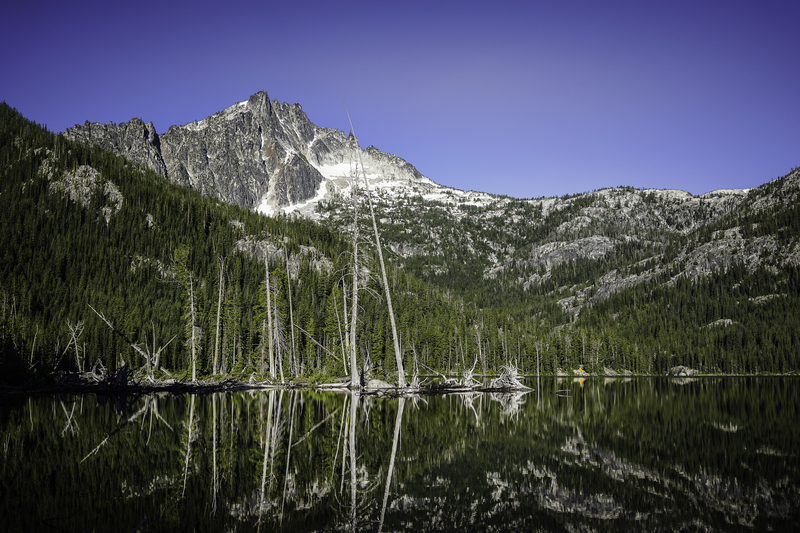 The Enchantments wilderness area is a high alpine zone covered in clear alpine lakes and ringed by stunning granite mountains. The area is so beautiful and so popular that at one point 300 people a weekend were visiting the area to camp overnight, and trample the heather, and create a vast network of social paths, and leave trash lying around… too many people for such a delicate environment so the Forrest Service enacted a permit system in 1987, limiting the number of people who can visit the area between June 14th and October 15th to 60 people a day. The permit system itself is a lottery, you submit your permit between two dates and then your permit gets randomly selected. We applied for a permit this year and didn’t get one. Almost no one ever does. Looking North through Asgard Pass. When we realized that our now free weekend was the last weekend the Enchantments were open we both had mini-heart attacks. Although it was hard to sacrifice an awesome climb this was an opportunity we couldn’t pass up. We did a packing one-eighty. Kyle drove straight to REI to grab freeze-dried meals and a map, I gathered our backpacking gear and called the ranger station to ask about a couple of things. The ranger told me: yes, you will be camping on snow; no, you don’t need a bear canister, just throw your food bag on top of a boulder; watch out for goats; yes, high winds are forecasted and no, that isn’t unusual; the ticks are really bad around Snow Lake; have fun with the crowds. Of course it was going to be a popular weekend. Often times in June there is still snow on Asgard Pass. 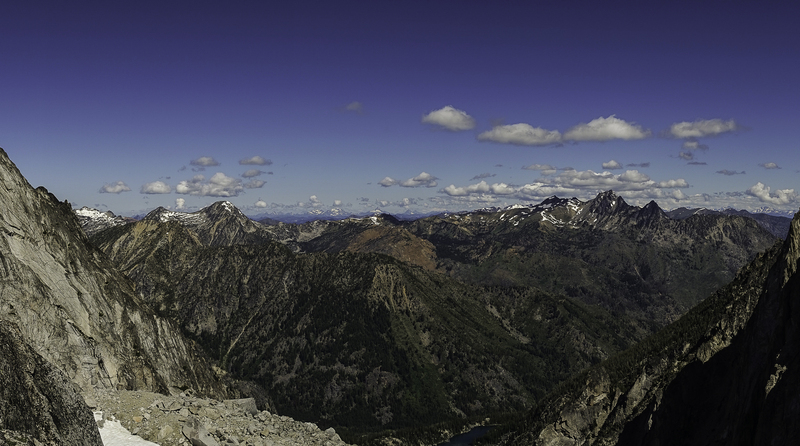 Asgard Pass is, more or less, the gateway to the Enchantments if you are approaching from Colchuck Lake. It is a 2,200ft climb in 0.8 miles and it alone discourages many hikers that would otherwise waltz into the Enchantment area. But with such a low snow year the pass was clear and although there was still snow in the higher lakes area the way in was doable. I expected it to be crowded but I wanted to do it none-the-less. We were packed and driving away from Seattle two hours after we had come up with a plan… like I said, most spontaneous adventure to date. 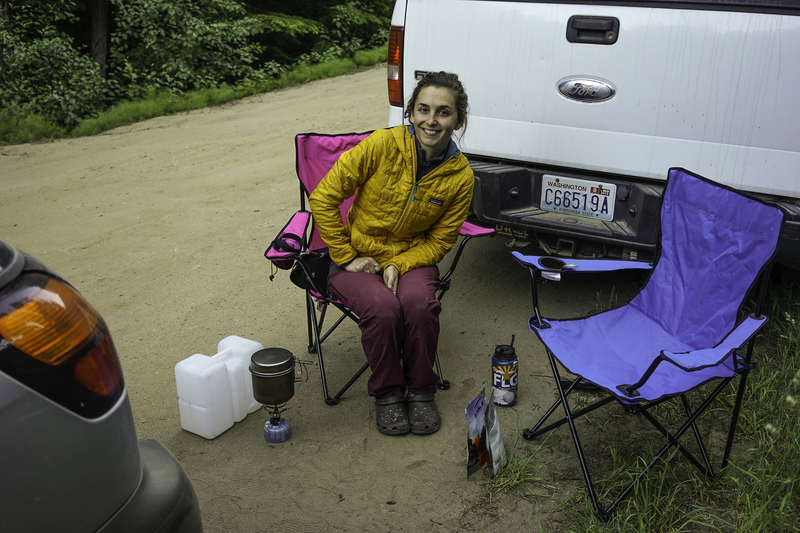 Camping out at the Stuart Lake Trailhead Friday night. Kyle and I had not been on a backpacking trip, just the two of us, since our road trip across the country after the AT. Not that we haven’t had adventures, climbed mountains, hiked the Narrows in Zion, run on trails… but last year, on this exact weekend, our first planned backpacking trip to Mt St. Helens was thwarted by Kyle’s torn meniscus. So finally, a year later, we were actually getting out and backpacking again. We started out at the Stuart Lake Trailhead at six o’clock in the morning on Saturday and planned on making it deep into the Core Enchantment Zone to camp that night. From the moment we stepped onto the trail this was probably one of the most magical weekends of my life. 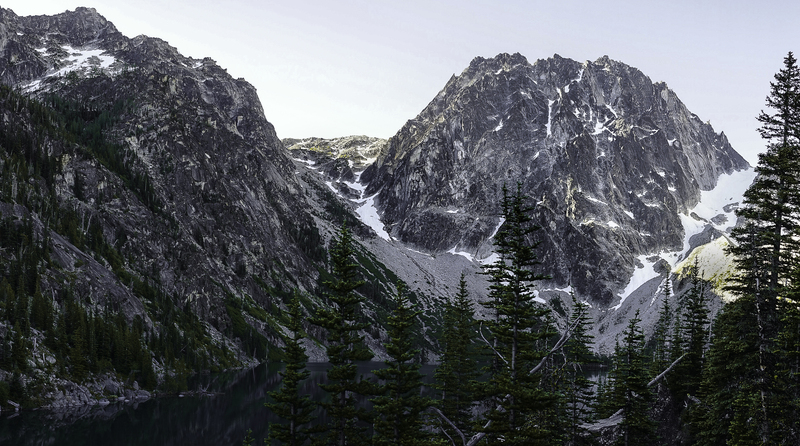 The Enchantments are nature’s prize eye candy, an artist’s intimidating muse, turning everyone into shutter bugs and making you stop to gape on a regular basis. There is too much to look at, too many beautiful sights to see. The different types of alpine change as you go up and just when you think you’ve seen it all a new jagged peak comes into view or a wild and rugged plant appears bellow a boulder. Trees straight out of Dr. Suess’ books dot the otherwise barren landscape and everywhere water flows. Snow bridges take you over clear pools and by ponds still sheathed in bright turquoise blue ice. The snow was old, having spent an entire winter up there, melting and re-freezing. It was streaked with red algae and pockets of goat poop appeared everywhere as the crystals melted under the hot sun. The way was marked by cairn towers but once you were up and over Asgard Pass you just needed to follow the boot pack, winding amongst lakes and through patches of gnarled pine trees. Despite stopping to take probably a million pictures we reached camp by twelve o’clock. We were rusty backpackers, we had forgotten our books and our crocs, two very important parts of hanging around camp for hours. We took our time setting up our tent, carefully anchoring the guy lines using rocks instead of stakes and getting creative with the set up. I fluffed our sleeping bags obsessively until the down was light as air. Kyle took a nap and looked at the map. Then it started to snow. Unexpectedly. There was 0% chance of precipitation on the NOAA forecast but these are the mountains, anything can happen. We hunkered down and waited for it to end, which it did around six o’clock, just in time for us to make dinner and eat it outside under clearing skies and amongst circling goats. Goats at our campsite at dawn. That’s right, goats. 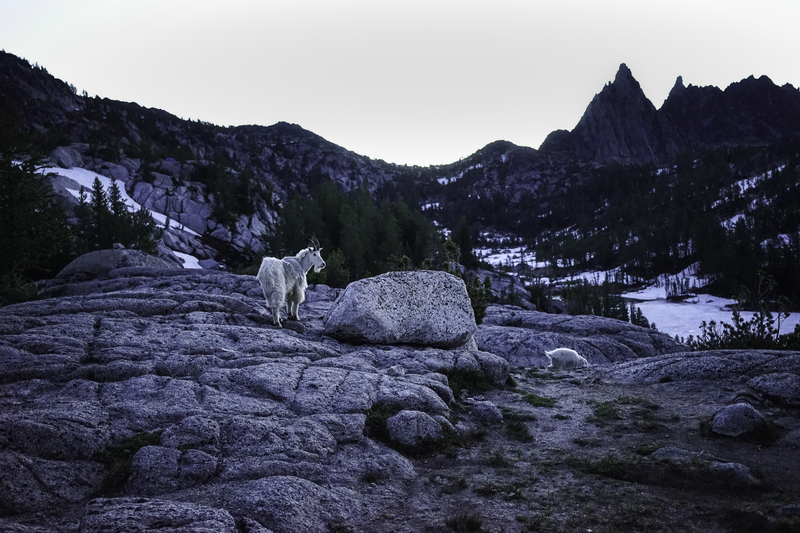 The mountain goats in the Enchantments, and much of Washington, are attracted to humans because they want, more than anything, to drink our pee. Proper peeing-around-goats protocol is to try to find two boulders and pee down the crack, or at least on top of a rock, but whatever you do don’t pee on dirt or plants. The goats will tear the delicate foliage apart to get to your salty salty goodness. Ugh. Kyle quickly established the goats as his nemeses, claiming they were out to spire him (I explained to his that this is not a word, or a thing that goats do, but he was convinced). Usually I am the one that is waking up to little noises around the tent but I slept peacefully without earplugs in, only to be awoken when Kyle would sit up suddenly, peering out underneath the rain fly for murderous goats looking to spire us open and drink the piss right out of our bladders. The next morning we were up at four and moving by five because we felt it would be a shame to miss sunrise on all of the incredible peaks that surrounded us. I cannot believe no one else was up. Nothing can beat the pink rosy rays lighting up the granite mountain faces for the first time, warming their cold rock that has been cooling under starlight and moon shine all night. We kept discovering herds of goats with new-born babies who were frolicking in the early morning glow. Goats know when to wake up. Our goal was to be out at the Snow Lake trail head by twelve o’clock to give us time to hitch back to our car and be leaving Leavenworth around one. We had been told by a German couple we met on the way in that the trail out by Snow Lake was very challenging despite looking mellow on the map and that just the one mile section above the lake would take us one to two hours to complete. Despite that warning we stopped to take pictures every couple of minutes, enraptured by the diversity and uniqueness of the beauty surrounding us and honestly, never wanting to leave. However, even with a few goat encounters, a stop to use the privy, a thousand photos, and a lot of slippery river crossing accomplished by crawling across icy logs, we made it to Snow Lake in very good time. After crossing a damn between upper and lower Snow Lake with our shoes off and giving our feet a serious refresher the trail became more established and we unwound our legs, letting them carry us down, down, down. We reached the parking lot at 10:30am, mouths still hanging open in shock at all the beautiful things we had seen. Heading up to Colchuck Lake. Asgard pass is above me to the left. Looking back down on Colchuck Lake. Looking up at the rest of Asgard Pass. Looking into the Core Enchantment Zone. Prusik Peak from a distance. We camped bellow by those other tents. Waiting out a little snow storm. After the snow the wild flowers came out. This is why you wake up at 4am. Down at lower elevations and amongst the trees again. Snow lake reminded us of Maine. The damn between upper and lower Snow Lake. I have been very quiet this past week. Part of me is still processing the immense beauty of the Enchantments and the ways in which it fed my soul. Other parts of me are missing it. Not just missing the actual rock and stone and sky but also missing the act of backpacking, the joy of moving myself through the world using just my legs and carrying my necessities on my back, the simplicity of it all, the adventure and the risk, but the safety and comfort as well. It had been too long since we had done a simple backpacking overnight, partly due to extenuating circumstances but also due to our exploration into new realms of adventuring. It felt good to get back to my outdoor roots, to the activity that started it all for me. When I donned my backpack on Saturday it felt like I was getting a hug from an old friend. Putting that backpack on, picking up my trekking poles, tightening my trail runners, hearing Kyle’s footsteps behind me… no matter where I experience that I am home. I am thrilled and honored to have added the Enchantments to the list of places where I have felt at home. Amazing pictures and beautiful writing to go with them!